At the 2007 Food Festival the Friends of Marple Memorial Park were approached by a lady called Gladys Romm, whose husband Leonard had always wanted to build a French Boules Court in the park after enjoying the game in France. Sadly Leonard passed away before realising his ambition but the Friends thought it was a great idea and agreed to take the project on. Money was raised with a special showing of the Railway Children film at Marple's Regent Cinema, at local events and an O2 "It's your Community" grant of £1,000. Later seating and interpretation was installed too with the help and support of Marple Civic Society, Marple Business Forum and a private donation by Mr. J. Louth in memory of his late wife, Kathleen. Our third French Boules Tournament was held on the afternoon of Sunday 28th August. Once again the weather was not what you would want for a Bank Holiday weekend but was what we've grown to expect. Eight teams of three players took part in a knockout tournament that included Marple Civic Society, Marple Community Council, Marple Business Forum, Friends of the Park and Arthur Procter and Friends. Finalists this year were Marple Civic Society and Marple Community Council, who fought a close run battle to 13 points. The Community Council were pipped to the post by last year's winners Marple Civic Society, with a 100% record having won both trophies donated by Kay Dee Hair and Beauty. Kay can be seen presenting the trophy to Marple Civic Society in the last photo in the set below taken by Arthur Procter and Mark Whittaker. Marple Civic Society receive their trophy from Sponsor Kay, of Kay Dee Hair and Beauty. Our second French Boules Tournament was held on the afternoon of Saturday 28th August, over the 2010 Summer Bank Holiday weekend. We decided that this tournament would be a little more serious than our first two years ago (although still hopefully fun) and would take the form of a knock-out competition. We had little idea how long it would take to run its course and therefore planned for it to involve just eight teams from local groups and societies. The organisations involved included Marple Locks Heritage Society, Marple Local History Society, Marple Civic Society, Marple Business Forum and the Friends of the Park and there ended up being nine teams in all. Kay Dee Hair and Beauty, of Market Street, kindly sponsored the winners' trophy. The weather wasn't good to us, especially in the morning when we were getting set up and it was a good job we had the gazebos. Things picked up as people started to arrive for lunch and the sun came out between light showers, so it could have been much worse. The tournament was eventually won by Marple Civic Society's A Team, after an exciting and closely matched final against Marple Business Forum's B team ended with a score of thirteen points to twelve! Below is a photo of Kay Gould-Martin, of Kay Dee Hair and Beauty, presenting the trophy that she sponsored and could easily have won, to Marple Civic Society. There are more photos taken on the day available to view on the Marple Website's Virtual History Tour. We're pleased to advise that the final stage of the French Boules Project was completed yesterday with the installation of a new display panel that explains how the court came into being and how to play the game. It also explains that sets of boules can be borrowed from Bob Wilson, the Community Parks Officer, during normal hours. The panel cost £790 and was partially funded by a generous donation of £250 from Marple Business Forum. The balance was made up from our own funds raised on the tombola at the 2009 Food and Drink Festival. We were extensively supported in this by local shops and businesses, many of them also members of the forum, who donated lots of fantastic prizes for the tombola. Full details of the businesses who have supported us are listed on our sponsors page. The whole project from start to finish has been community driven - starting from Gladys Romm's original idea and the signatures she collected to show community support. This enable us to obtain an O2 ‘It’s Your Community’ Award of £1,000 towards the main construction works. The balance of around £1,300 was raised at local events and the special showing of The Railway Children film at the Regent Cinema, which of course was attended by many local people. The Community support continued with donations for seats from Marple Civic Society and Mr. Louth, a member of the local community who gave much more than was necessary for the seat he wished for to commemorate his late wife Kathleen. Incidentally, the vandalism to Mr. Louth's seat mentioned below has been repaired by the Friends of the Park and we hope that this the project will not be marred by a repeat of this disgraceful behaviour from a small minority of our otherwise excellent local community. Thank you to everyone for your support and we hope you enjoy using the court. It was with huge disappointment we discovered today that the bench dedicated to the memory of Kathleen Roberta Louth and paid for by her husband Jerrold had been vandalised by someone carving the initials J + T 4EVA into the woodwork below the commemorative plaque and then filling them with ink. This contemptible action must have been very distressing for Mr. Louth when he discovered it last week and we wonder at how anyone can be so mindlessly ignorant of other people's feelings to do something like this. We have taken photographs and will be reporting it to the police but will not pander to any potential exhibitionist tendencies by displaying them on this site. The section of timber has been removed from the bench today and will be replaced once it has been repaired. We can only hope that this was an isolated incident which will not be repeated. We're happy to report that the new benches are now installed in Memorial Park alongside the French Boules Court. As already explained, one was purchased by Mr. J. Louth and is dedicated to the memory of his late wife, Kathleen. Mr. & Mrs. Louth were great supporters of the Iron Bridge Restoration Project but sadly Mrs. Louth passed away before she could see it finished. The second seat was purchased by Marple Civic Society, and we thank them for showing their support for the Boules Court project in such a positive way. The third seat was purchased by the Friends of Marple Memorial Park but was aided by Mr. Louth's generous donation of significantly more than the cost of the seat for his wife. This third seat is dedicated to the memory of Leonard Romm, who had the original idea of constructing a Boules Court in the park but passed away before realising his ambition. This is our thank you to Gladys Romm, who brought Leonard's idea to our attention and then worked so hard to help us bring the project to fruition by raising a petition and even being interviewed on local radio. Thank you Gladys! We're delighted to advise that our appeals for help to purchase some seats for the French Boules Court have been a great success and we recently took delivery of three new commemorative benches similar in design to the one installed in memory of Jim Heald a few years ago. We are very grateful to Marple Civic Society for their donation of £750 towards the cost of one of the new seats. We also have to thank Mr. J. Louth who has donated £1,000 for a seat in memory of his late wife who sadly passed away last year. Mr. Louth's very generous donation more than covers the cost of one seat and was originally going to be used to pay for the installation by the Parks & Recreation Team. However, since then the Parks Team have decided that they will not charge for the installation work. This meant that the Friends Group were able to afford a third seat from our own funds. We will tell you more about who our seat will be dedicated to once they are installed, which should be within the next couple of weeks. Marple Business Forum held a tournament on the court on the evening of Monday 27 April. It started at 6.30pm and ended around 9pm when it was nearly pitch black! The weather was great, far better than expected after rain all day, and everyone seemed to have a good time as you can see from the photos below. There was a good turnout for our French Boules Tournament yesterday and everyone seemed to have a great time. It really is a most sociable game and was enjoyed by people of all ages and abilities. The following pictures taken during the event hopefully show how much fun everyone had and there are more to view on the Marple Website Virtual Tour. Anybody wishing to give the game a try can borrow a set of boules from Bob Wilson, the Community Parks Officer who is usually in the park during normal hours. You will need to pay a £10 deposit, which is fully refundable providing that the set is returned to Bob complete and intact. Alternatively, you can buy an extremely good value set from ALDI in Romiley for only £5 while their stocks last. Thanks Pete and thanks Glad - we look forward to the fun starting at 1pm tomorrow in the Park. He/she then throws the "cochonnet" between 4m and 8m, or 6 to 10 paces from the circle in any direction. It also must not be closer than 1m from any obstacle. A player from the other team then steps into the circle and tries to place a boule closer to the cochonnet than their opponent, or to knock the opponent’s boule away. You must throw within 1 minute of your turn starting. The boule nearest to the cochonnet is said to be “holding the point”. When both teams have no more boules, you stop and count up the points. The winning team scores one point for each boule nearer the cochonnet than the opponents closest. Only one team can score points in each round. A player from the team that has won throws the cochonnet from a new circle drawn round the cochonnet’s last position. The winners are the first team to reach 13 points (or whatever total you decide). Off to a flying start with the construction of the Boules Court underway already. Work started on Thursday last week and at the rate they're going it'll soon be finished. The contractor is Lane's Landscapes. The Friends of the Park are delighted to announce that they have been awarded an O2 ‘It’s Your Community’ Award of £1,000 towards the cost of constructing a French Boules Court in Marple Memorial Park. This award means that we have now raised enough money for work on this great new feature in the park to get underway. At last year's Food Festival the Friends of Marple Memorial Park were approached by a lady called Gladys Romm, a regular user of the Senior Citizens’ Hall, who explained that her husband Leonard had wished for a French Boules Court in the park after enjoying playing in France on holiday. Sadly Leonard passed away before realising this ambition. Gladys was delighted when we responded enthusiastically to her suggestion and while the ‘Friends’ began raising funds she managed to collect over 270 signatures on a petition to show just how popular this new addition in the park would be within the local community. Pétanque is a form of Boules invented in 1907 by a Frenchman named Jules Lenoir, when rheumatism prevented him from running before he threw the ball. For that reason it is a gentle sport suitable for people of all ages and conditions, and in France it's also big part of community social life. With the Senior Citizens Hall so near to the park we felt that introducing a Boules Court would encourage them to walk, exercise and socialise in the open air more frequently. With the court being in an freely accessible public space, it would also be available to many other local groups to use. The Friend of the Park raised over half the money needed to pay for the court with tombolas at local events, like the Food Festival, Carnival and Locks Festival, and with a special showing of the Railway Children film at Marple’s Regent Cinema. We expected to have to raise the rest of the money in a similar way too but thanks to the level of community support Gladys managed to show with her petition we realised that the project could be an ideal candidate for an O2 ‘It’s Your Community’ Award. Thankfully, ‘It’s Your Community’ thought the whole thing was a great idea too! 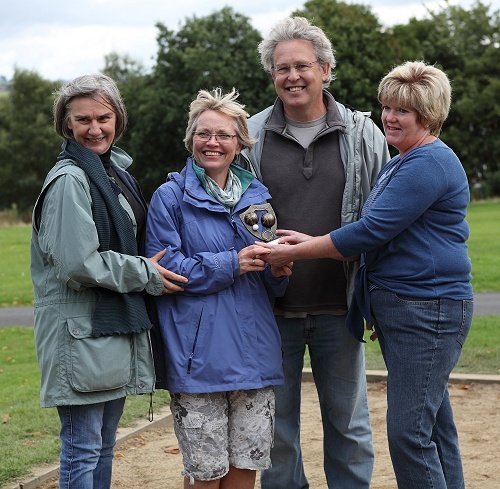 We're really pleased to have won this award as we think a Boules Court will be a fantastic addition to our park. We're also delighted that we’re going to be able to make Glad’s wish come true as she worked so hard to show that it is something the community really wants. Although the Friends have now raised enough funds for the court to be constructed we would also like to be able to install some benches around it so that players can enjoy their games of Pétanque even more, and spectators can watch in comfort. We are therefore talking to other local community groups in the hope that they will be able to help us to find the funds for this. We would also like to talk to anyone who may wish to pay for one of the benches to be sited near to the court in memory of a lost loved one. If you are interested in this please ring Mark on 0161 427 4955.